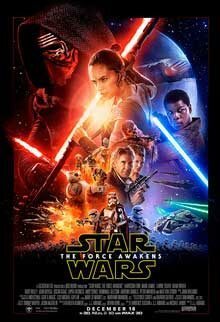 Although The Force Awakens draws heavily on plot elements from the original Star Wars, John Williams’ score remained in a style more reminiscent of the prequels than the original films. To be sure, there are numerous appearances of many themes from the originals, but like the prequels, the score revolves largely around a single substantial theme that is supplemented with several shorter ones. The analysis below describes how the new themes in the score express their association through their musical structure. Williams’ theme for Rey is the centerpiece of the score both because it is associated with the film’s main protagonist and because it sounds more times than any other theme in the score, and by a wide margin. It is no surprise, then, that the theme takes on a more substantial musical structure than the other new themes, incorporating three melodic components, the first two of which constitute a lengthy introduction to the theme proper. In the concert version of the theme, these components are arranged in the following order: motive 1 – the opening long-short-short-long, or gallop motive, which is repeated several times; motive 2 – the slower chime-like motive follows; and the main melody that these motives lead into. These components can be viewed as expressing various aspects of Rey’s character. While the gallop motive’s rhythms are rather fast, its orchestration is always kept light, suggesting not only Rey’s physical agility through her climbing abilities, but her mental agility as well through her ability to discover how to wield her Force powers quickly when she needs them. The chime-like motive is quite different from the gallop. Its notes are placed in a mid to high register and its orchestration focuses on pitched percussion, instruments whose sound quickly dies away. Together, these elements suggest a kind of isolation that reflects Rey’s situation as someone whose parents left her as a young child and never returned. This motive is also slower, more evenly spaced, implying a sense of self-assuredness, and the melody keeps returning to its initial note, suggesting a character who is pensive and given to introspection. In the main melody, the gallop motive sounds in the accompaniment whenever the main melody rests on a longer note, but more subtly, the melody draws its rhythm from the chime motive while its notes are an outline form of the gallop motive, effectively fusing the motives into a single entity and painting a musical portrait of Rey’s character. In the film, Rey’s theme is first heard much like the concert version, with the gallop and chime motives as an introduction to the melody proper. Thereafter and until the end credits, however, statements of the theme are restricted to its main melody as the primary element. Hence, the lengthy introduction to the theme, which is an unusual aspect for a Star Wars theme (and even more unusual to be heard in the film proper) allows its main melody to act as a shorthand for the separate motives and hence suggest more than it could otherwise. As is well known, the opening of the theme proper has the same underlying harmony as the first half of the Force theme, a progression from a minor tonic i chord to the major subdominant, IV, clarifying Rey’s connection to the Force. This similarity between the themes goes beyond the first half of each theme. In the second half of the Force theme, which is much more rarely heard in the Star Wars films than its first half, the melody rises up to a climactic tonic note that is harmonized by a poignant VI chord in the minor mode. Though the main melody of Rey’s theme has two different second halves, both of these second halves begin with a climactic tonic note supported by the minor mode’s VI chord (though now in first inversion). Unlike most other prominent characters in the Star Wars films, Kylo Ren is granted two different themes, no doubt due to the division he feels in his allegiance. On the one hand, Ren is a typical agent of the Dark Side, wreaking a menacing path of death and destruction. Yet on the other hand, he is regularly conflicted about his allegiance to the Dark Side because of a pull he feels towards the Light Side. And since he compares himself to his grandfather, Darth Vader, looks to him for Dark-Side inspiration, and has followed a similar pathway thus far, being a pupil of a Jedi master who turned to the Dark Side, it is only fitting that his themes draw on aspects of Vader’s. This theme is a short, repeated motif that can be heard as distantly related to the second half of Vader’s theme, as shown by the boxed portions below. (The arrows show a closer relation through the particular notes in the chord.) It is heard in most scenes where he is approaching to threaten, harm, or attempt to bring opponents under his control. Structurally, the theme is another short motif, this one based on pulsating repeated notes. Once introduced, however, its usage becomes fairly interchangeable with the menacing theme. It can therefore take on different meanings depending on its context. When associated with Ren’s Light-Side dilemma, the repeated notes can be heard as a source of irritation that cannot be soothed (especially with the second chord, which introduces a biting dissonance). By contrast, when it appears in more menacing situations, the repeated notes can be heard as a persistent threat that cannot be eliminated. Unlike the individual motives in Rey’s theme, the two themes for Ren are never fused together, suggesting that he is unable to reconcile the two conflicting sides of his personality. Excluding its introduction and contrasting B section, the core of this theme is its A section, a passage notated as eight bars that sounds more like four bars in a 4/4 time, especially since the piece is a march. With this in mind, this A section of the Resistance March sounds like a theme that is left deliberately open, the more so since it ends with a cadence on the dominant chord and hence sounds unfinished even when the entire section comes to its end. This expression is fitting for its use in the film since it functions mainly as a good-guys’ action theme, and allows for a continuous musical fabric to accompany battle scenes while still incorporating themes with associative meaning. This theme is another that accompanies action scenes, but generally those where Finn is the central character for the moment. As the narrative turns more towards Rey, Kylo Ren, and Han, so the Finn/action theme falls away and yields to the other themes listed above, and hence the theme is only heard in the early part of the film. Perhaps the theme’s most prominent features are its alternating meter of 3/4 and 5/8, and its basis entirely in quartal harmony. Each 5/8 bar is one eighth note shorter than each 3/4 bar, and thus every time the theme immediately repeats (as it does whenever it is heard), the return to 3/4 bar after the 5/8 sounds like it enters a note too early. Consequently, the rhythm sounds as though it is tripping over itself in moving forward, an apt musical analogue to Finn and his companions’ frantic running as they are fired upon. Quartal harmony describes chords that are built from stacking intervals of fourths rather than thirds. Despite their differing construction, quartal chords of three or four notes have all but one of their notes in common with third-based (or tertian) chords. And curiously, the one different note can be any of a quartal chord’s notes. 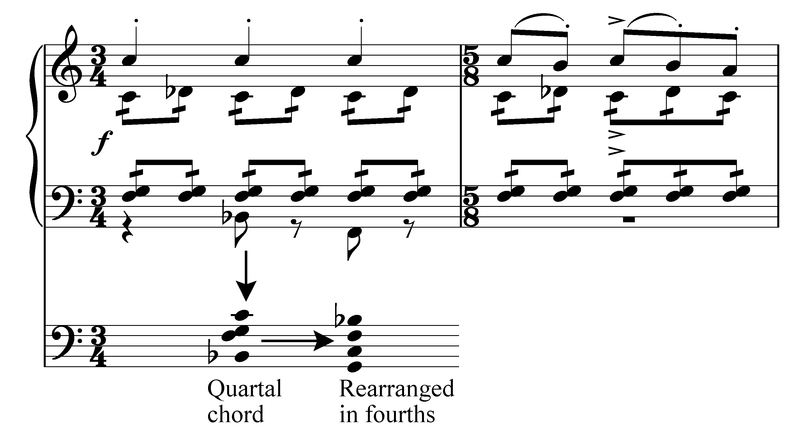 As a result, when placed in a context where there is no clear tonic, as here, quartal chords sound like tonal harmony in which the tonal center has been obscured. In other words, there is a fundamental instability to quartal chords that render them suitable for action music. They also lack the biting dissonance of semitones and tritones in this case, which gives a lighter feel that supports the moments of levity Finn inserts into these scenes. The themes discussed above are the most prominent ones in The Force Awakens. The other themes in the score appear far less often, sometimes only in a single scene. Nevertheless, I would like to point them out here for the sake of comprehensiveness. This theme’s soaring melody with wide leaps well depicts the character’s unmatched abilities as a pilot. With its large downward leaps and outlining of a scale-degree figure of 5-6-5 in the minor mode, this theme expresses a deep sadness, no doubt that of Luke, who has fled into a self-imposed exile. The same musical characteristics are also present in Williams’ main theme for Schindler’s List, which likewise expresses a deep feeling of grief. This theme consists of an oscillation between two minor chords a tritone apart that suggests the mystery of where Luke Skywalker is. The same harmony opens the Ark Theme in Raiders of the Lost Ark. While many have pointed out this theme’s timbral similarity to the scene in Revenge of the Sith in which Darth Plagueis is mentioned (and therefore speculate that Snoke is Plagueis), Snoke’s theme differs in that it is given a melody whereas the other is a single repeated tone. Snoke’s melody is also based on the interval of the diminished fourth, which for centuries has carried connotations of death, grief, and most appropriately for this theme, fear. I find your post very interesting to read and specially to hear. I am a musician myself and a huge fan of film music like Star Wars. I play in an orchestra called the “Limburgs Fanfare Orkest” which are the best musicians (amateur as well as professionals) from all of Limburg together (Limburg is a province of The Netherlands). We consider ourselves to be the best Fanfare Orchestra in the world. If you are interested please listen to us on YouTube or go to http://www.limburgsfanfareorkest.com. For our next project, we want to play the movie soundtrack from the new Star Wars trilogy. Is there a possibility to perform some of the John Williams music? Maybe we can perform this project together? Dear Bart – thanks for your kind note on my analysis. As for performing this music, I am not the person to contact as I have nothing to do with the copyright or permissions associated with this music. But I do enjoy listening to it and analyzing it! your posts are very interesting. Great Job. Do you know, where i can buy the scores of Star Wars Music, and movies scores in general? Love this! I just happened upon this article, searching for music for my young piano students who love this movie. Thanks for identifying the main themes so clearly, so I can discuss with them! I am also a music theory lover, so love the in-depth analysis. I’m going to look for more of your articles.